When FarFetch invited me to take part in their fashion challenge to style a designer dress for the Autumn/Winter seasons, to show that dresses shouldn't be neglected when the weather turns colder. I couldn't resist creating the ultimate *dream* designer outfit that is both practical and stylish. With the dress as my starting point for the look, I decided to go for this comic number from Lanvin. As a self-confessed addict of anything space inspired I knew I had to include this dress and use it as a source of inspiration for the look. 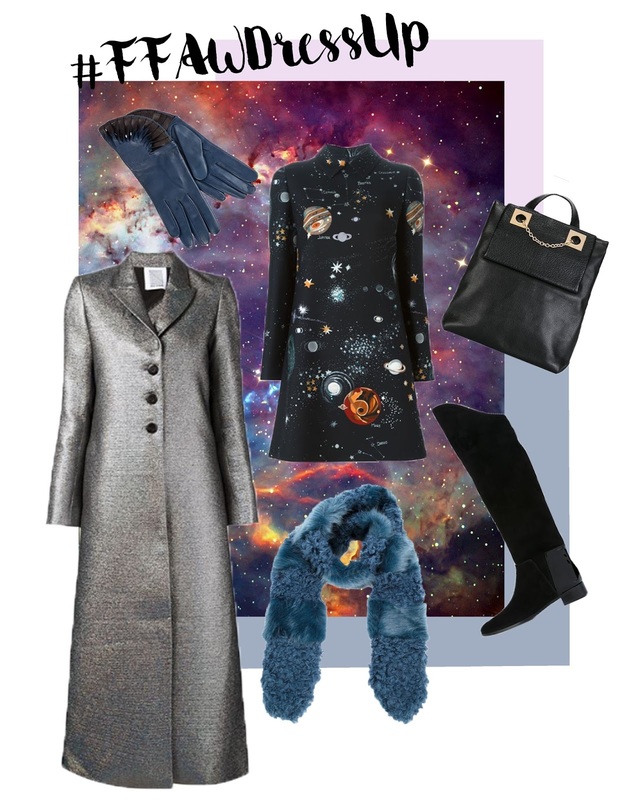 With space on the agenda this metallic coat was one of those items that I immediately fell in love with. Besides from being extremely stylish I can imagine it being exceptionally warm come the colder months. Long coats are definitely a A/W 'must' in my books as there is something so chic about wearing an oversized coat, over a feminine mini-dress. Next up are these amazing Charlotte Olympia boots. For me I don't think any 'designer' outfit is complete without a piece from (my all time favourite shoe designer) Charlotte Olympia. These knee high boots would be perfect for running around town doing errands to even dressing up a simple outfit. Now for those all important accessories-the items that can immediately transform an outfit. With practical being key for the look I decided to opt for this See by Chloé backpack to keep all your trusted belongings safe and weather-proof in this leather bag. Which I decided to pair with this gorgeous faux fur scarf from Shrimps (the brand of faux-fur dreams). Finally I finished the look with a pair of these teal Thomasine 'Paris' gloves, as I often choose my accessories based on the colours in the outfit i.e. the dress. So there you have it your AW proof outfit is complete, with an added pair of tights-for obvious reasons.